TraderFeed: Do Market Prophets Bring Market Profits? 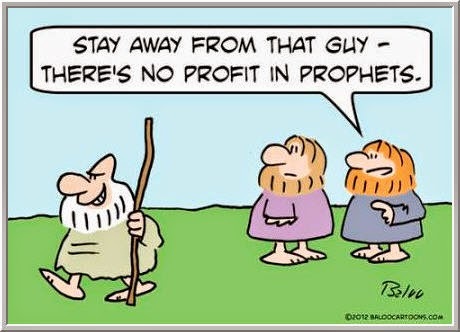 Do Market Prophets Bring Market Profits? We don't have to be exposed to the financial media for long before we're inundated with market predictions. How valuable are those prognostications? Do market prophets truly bring profits? An excellent 2014 review of market prophecies from The Mathematical Investor answers this question: as a group, the prophets have not been profitable at all. The performance of funds has largely fallen short of benchmarks; the doomsayers have brought doom to their followers; and even those forecasters who beat the market over a prior ten year period are likely to underperform the following year. Markets by their very nature possess a high degree of uncertainty as well as risk. It is understandable that traders and investors would seek an illusion of control by either listening to the predictions of others or by investigating so many relationships that finding significant ones becomes inevitable. This is particularly the case when market participants become wedded to particular bearish or bullish views. Their predictions are particularly susceptible to confirmation bias. There is, however, a deeper problem at work. It is an epistemological problem: a problem with understanding how science truly operates in generating knowledge. Before scientists render predictions, they observe phenomena and try to make sense of them. Understanding and explanation precede prediction: that is the role of theory. Predictions follow from good theories, not from endless data manipulations. If you want to judge a prediction, you don't have to wait to see if it plays out: you can evaluate the explanatory framework from which it is derived. I recently visited a very successful trader. When asked what he thought the market would do the next day or week, he candidly acknowledged that he had no idea. In fact, he said that, when he becomes wedded to predictions, he is most likely to lose flexibility in markets--and also lose his shirt. What made this trader successful was that he had a sophisticated understanding of different market participants, the markets in which they typically participate, and the times of day in which they typically execute their trades. When he saw these participants do certain things in one market at a certain time of day, he knew that there was a high likelihood of follow-up events in other markets during the next time interval. He was less interested in market prediction than in understanding what other traders were doing and responding to that. To be sure, his underlying theory of market participation did lead to an anticipation of future events--his trades, in that sense, represented the predictions following from his understanding--but, for him, prediction was the end point of an intellectual process, not the starting point. It certainly was not the main point. Prophets typically put predictions front and center because they place themselves front and center. More show horses than work horses, they rarely put in the effort to generate insightful theories as to why markets should move in a particular way. They might cloak their prognostications in pseudo-mathematics or in convoluted wave counts, numerological sequences, and chart patterns, but what is missing is understanding: a coherent explanation of why markets should behave in the anticipated way. All too often, prophets fit world events into their preconceived views. Profits come from identifying what is happening, explaining it rigorously, and acting accordingly. Is the Market Rally Broadening or Narrowing?